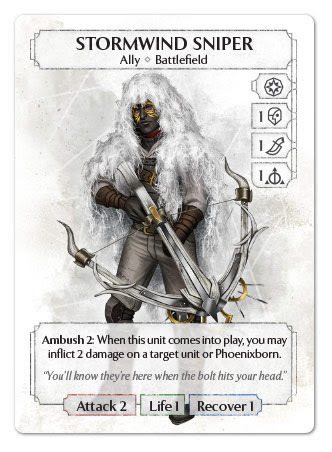 Hello everyone, and welcome to another instalment of my preconstructed deck reviews, aimed mostly at new players who want to know more about the various cards and strategies in the game. 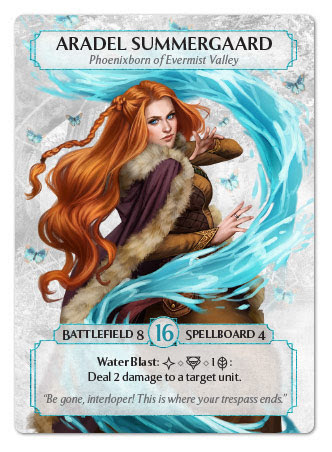 As we already covered five of the six decks that come in the base set, today it’s time to address the final one: Saria Guideman‘s Cloudsea Siren deck. 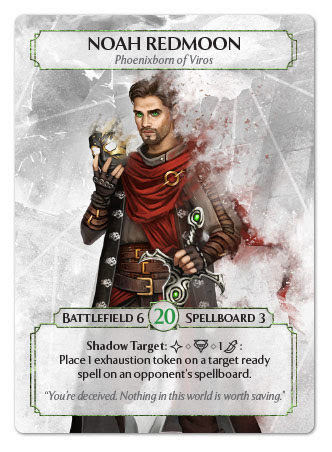 With a Battlefield limit of 5 and a Spellboard of 4, Saria falls in the middle of the Phoenixborn cast: nothing noteworthy, neither good nor bad here. Her life value of 20 is slightly above average, and is quite good considering that she’ll probably aim for a long-term strategy. Her special ability, Heart’s Pull makes you draw a card for a Side Action and a Charm die once per round, granting you a nice card advantage: you’ll be basically be running 6 cards and 9 dice instead of 5 cards and 10 dice per round, if you wish, which means you’ll have slightly more flexibility than your opponents. 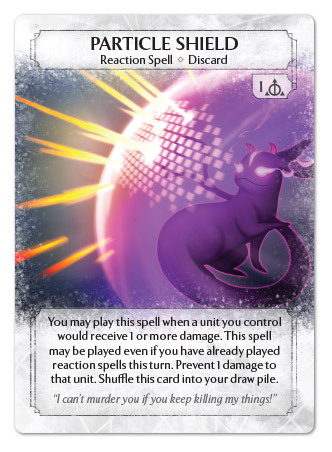 The relatively low cost of many of Saria’s cards (with some of the most expensive allowing you to choose how many die you want to invest when activating them) makes spending a die to get an extra card not much of a burden to your energy reserves. 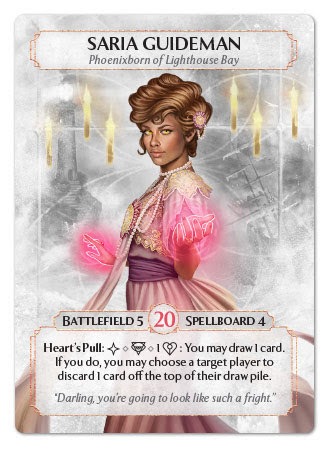 In addition, when drawing with Heart’s Pull you’ll be able to make the opponent discard a card off the top of their draw pile, laying the foundations for a “discard” strategy – further supported by many other cards in this deck, as we’ll see later – and also providing a way for the Enchanted Violinist to trigger her Song of Sorrow. With Illusion providing dice and board control, and Charm here showing two of its characteristic traits: deck and hand disruption, this deck is unique amongst the six of the core set, as is it goes for a totally different strategy: locking down the board as much as possible and attempting to deplete the opponent’s deck – also commonly known as “milling”. Its goal is to stall the game long enough, removing enemy options and preventing the opponent from attacking, and to get to a point when the opponent starts taking damage from being unable to draw in the Prepare Phase. If you manage to get there, the game will be usually over in a few rounds, but you need to exploit every trick in your sleeves in the meantime, because your opponent won’t sit down and stare at you tearing through their deck, and will probably press the attack and attempt to close the game before it’s too late. In this situation, both the Illusion and Charm dice power come in handy, although for totally different reasons: Illusion will help you undermine the enemy supply lines, removing any key dice they’ll need to play their most useful cards. The lower the number of dice at their disposal, the shorter their rounds will be, allowing you to get to the late game quicker (yes, I know, more cards sitting unused in their hand means they’ll draw less, but more on that later), and if you take out specific magic symbols, you’ll force the opponent to meditate more, thus advancing your win condition. On the other hand, the purpose of the Charm die in this deck is mainly defensive in my opinion, allowing your overall fragile units to survive from round to round, instead of providing extra damage, as you probably won’t be attacking much. That is, of course unless you actively work towards creating avenues for surgical attacks, which is something you definitely can do, but – still in my opinion – requires a bit of build-up; in this situation you can exploit the attack bonus granted by the Charm die to put more pressure to the opponent and make the threat of depleting their deck even more significant. 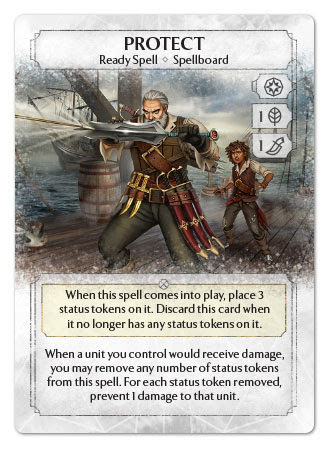 Saria’s unique card is Summon Seaside Raven, a Ready Spell with the somewhat hefty activation cost of a Main Action and 3 basic dice. Although not requiring specific symbols lessens the impact on your dice pool as you are free to choose whichever combination you need, the amount of dice spent in a single time is somewhat taxing to your reserves, more so if you consider the relative fragility of the Seaside Raven itself. Sure, it possesses the Magic Guard ability that renders immune to all spells controlled by the opponents: it can’t be targeted by spell effects, can’t be hit by effects that affect multiple units without targeting, or spell effects don’t directly target it but affect him somehow (like for example Transfer), nor may Alteration Spells be placed on it by an opponent, but there are still a lot of effects and abilities that can interact with the Raven and render it useless – most of them cheaper than the 3 dice you had to spent to play it in the first place. 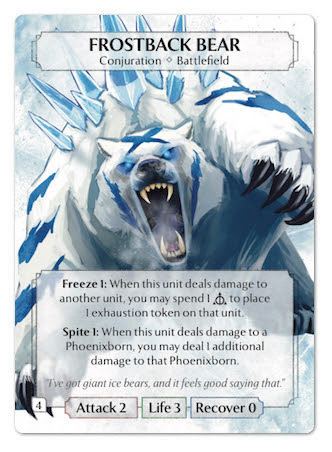 Phoenxborn and Unit abilities that deal damage or exhaust units, like Aradel‘s Water Blast, the Blue Jaguar‘s Gaze, the Anchornaut‘s Throw or the Fire Archer/Stormwind Sniper Ambush, all are able, if not to remove the Raven from play, at least to weaken it for a Nature Die ping or to render it useless for a round. Its main drawback here being its relatively low Life value of 2, which makes it pretty vulnerable for a 3-dice unit, and most likely requires you to spend more dice in the form of the Charm Power to increase its endurance. 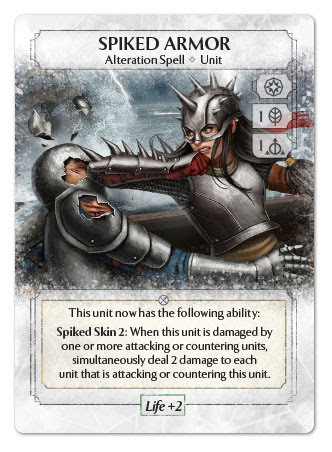 Be also aware of Spiked Armor, whose ability is granted to the unit it is attached to, so technically the 2 damage from Spiked Skin originate from the unit and can spell doom for the Raven. With an attack of 3 and the ability to hit first due to Battle Advantage, the Seaside Raven is an excellent unit killer, easily making short work of strong brawlers like the Hammer Knight or the Frostback Bear without worrying to trigger their special “on damage” abilities. Its ability to surgically swoop on strong enemy attackers can act as a support for Saria’s discard strategy, allowing you to suffer less damage overall, and to get easier to the late game where all your discard effect convert into damage on the enemy Phoenixborn. 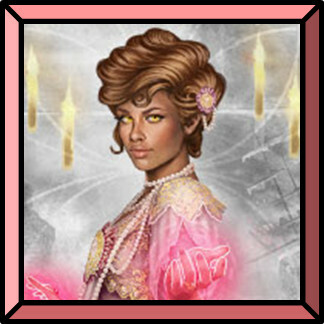 On the other hand, if you manage to create gaps in the enemy defenses with the help of Enchanted Violinists, Rose Fire Dancers and Sympathy Pain, you can also plan to use the Raven offensively, maybe packed with some Charm dice for extra damage. 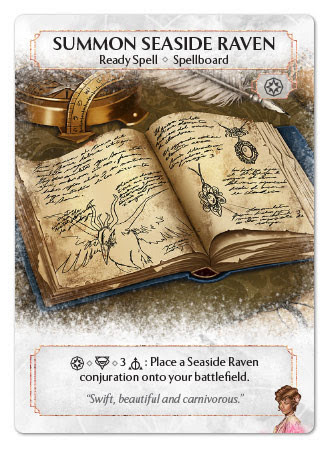 Weird aspect about this spell: it has a conjuration limit of 2, but no focus ability, so you won’t probably need a third copy in play, unless you plan to reuse it over and over again to replace a lost Raven (but that will cost you 9 total dice, not sure how much it is worth), but still having three copies in the deck could help you to get a second one in place faster if you want, especially given Saria’s incredible card draw potential. Saria’s three other Ready Spells work in conjunction one another to quicken the grinding of the opponent’s deck. 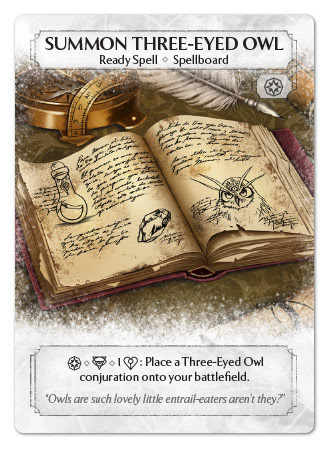 Summon Three-Eyed Owl is one of the most annoying spells in the game to play against. At the cost of one charm die, its activation is super cheap, and allows you to refill your battlefield turn after turn with minimal effort. 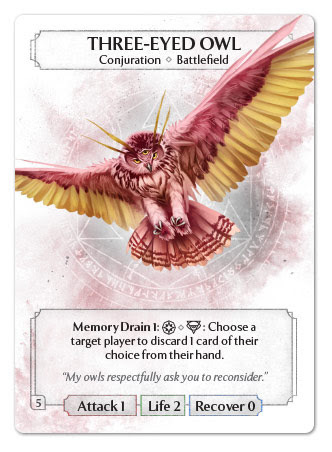 The Owls themselves are an excellent 1-cost unit, with an attack of 1 and a good life vale of 2, which makes most attempts at destroying them more expensive for your opponent’s reserves than yours. 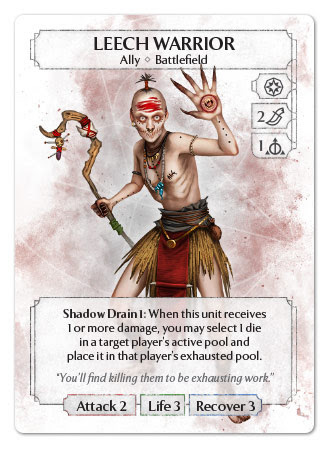 Their utility as cheap chump blockers for enemy attacks is surpassed by far by their special ability, Memory Drain, which, by spending a Main Action and exhausting the Owl, forces the opponent to choose and discard a card from their hand. Not only this limits the options at their disposal during the current round, but also indirectly advances your “deck discard” strategy as the opponent will be forced to draw more in the following Prepare Phase, thus emptying their deck faster. Having a Three-Eyed Owl down in the first round can hurt the opponent’s First Five strategy a lot, so when play against this deck keep in mind that you would risk not using one of your key cards. In order to prevent this you could either aggressively attempt to destroy the Owl as soon as it comes into play (direct damage is much better than attacking here, as Saria could step in to protect the Owl, potentially triggering a Sympathy Pain in the process) or – if you play Ceremonial – you could include a low attack ally, like the Anchornaut or the Living Doll in your First Five as a sacrificial card for Memory Drain, since you could still recover it with the Ceremonial Power later. Abundance is a card with a pretty weird design, compared to most of the other in the game. It costs a Main Action and an Illusion die, and then it allows you to spend a Main Action to let each player draw up to 2 cards. 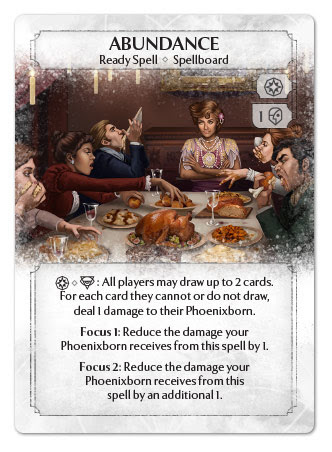 If a player can’t or doesn’t want to draw, however, that player’s Phoenixborn takes 1 damage for each card that wasn’t drawn (with the option of mitigating the damage your Phoenixborn would take for each focused copy of Abundance). Free card draw is good. Making the opponent draw as well while it is you that spend actions… well… that is less good; so, what’s the point of this card? 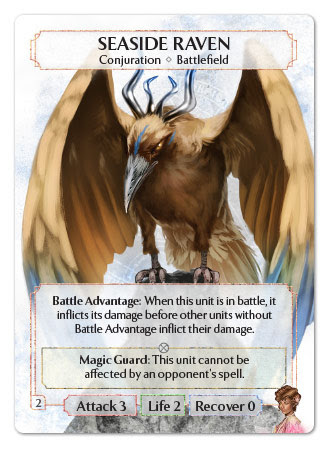 First of all, Saria has – with the exception of Seaside Ravens – access to relatively cheap cards, plus an incredible resource accelerator like Hidden Power, so drawing more can give you an edge over opponents with higher costs. Moreover, you will be also making the opponent discard with Three-Eyed Owls, thus basically turning all the card draw into milling, and you have access to Illusion dice, through which, as I already wrote above, you could exhaust any key dice the opponent could need, so they’ll get stuck with a hand of cards they couldn’t use. When you reach the late game and your opponent has no cards in their deck anymore, Abundance can deal the killing blow to the enemy Phoenixborn (a double-focused Abundance scores you 6 damage per round, dice-free) and can help you overcome the obstacle posed by opponents who refuse to play cards from their hand so they wouldn’t be forced to draw, or can’t play those cards because you keep exhausting their dice. While Abundance and the Three-Eyed Owl work indirectly towards your discard victory condition, the last Ready Spell at Saria’s disposal, Purge is more straightforward. Once in play, by spending a Main Action and a Charm die, it forces the opponent to discard a card from the top of their draw pile, thus getting your opponent closer to the “point of no return” where they begin to take damage from being unable to draw. Furthermore, if the spell is focused, you have a chance to pay an additional cost of 1 basic die each time you activate its ability, to force a second card to be discarded. With time and dice at your disposal, you will eventually deplete the opponent’s deck for good. There are two strategical issues with this card that must be taken into account: the first and more obvious one, is that once your opponent’s deck is empty, Purge becomes completely useless, as it won’t further increase your winning chances, so, unless the opponent has ways to get cards back into his or her deck, you’ll find a better use by meditating it away (which will save a card from you deck or hand by the way, reducing the risk of emptying the deck yourselves). The second, subtler and most important issue is that while Purge allows you to get to your strategy’s critical point faster, it doesn’t do much along the way. You spend actions and dice to grind through the opponent’s deck, but you don’t affect either player’s current game state: you don’t put units on the board, don’t put pressure on the opponent, nor you control their board or their current options. 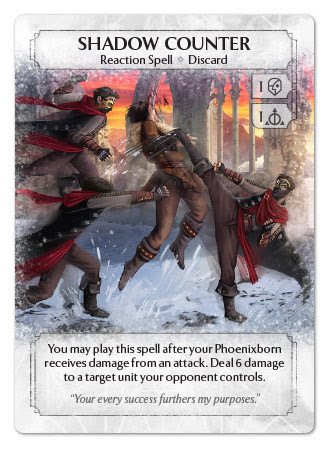 What this card basically does is converting your spare dice into “future” damage, which may or may not come into effect depending on your overall gameplay, so my suggestion is to avoid investing too much on it, unless you can gain and maintain a solid board control. The best moment to use it, in my opinion, is at the end of the round, especially if your opponent has no more dice to spend and is forced to pass, as you will be able to freely spend up all your unused dice without fearing too much about giving the opponent two turns in a row to do their things. Saria has two allies, that help controlling the opponents’ battlefield and prevent enemy unit from becoming too much of a threat. The first of Saria’s allies, the Enchanted Violinist, is a really vicious unit. 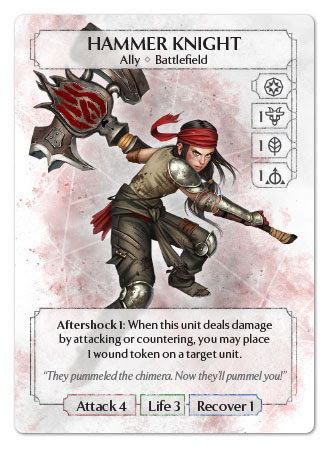 Another 1 attack/2 life unit costing a single basic dice, it is definitely a really cheap blocker and comes with an extremely powerful unit-killing ability. Let’s compare with the Nature Power: side action, spend a Nature Power die to deal 1 damage to a unit. Damage that can be prevented by effects like Protect or Particle Shield, and that can trigger abilities like the Living Doll‘s Pain Link or the Leech Warrior‘s Shadow Drain. 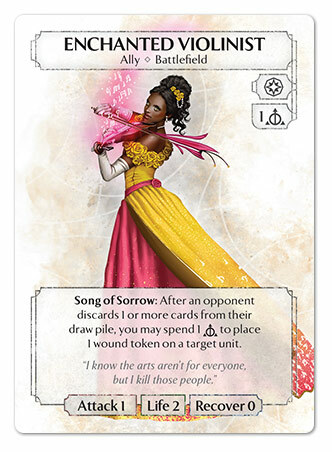 The Violinist’s ability, Song of Sorrow, on the other hand, doesn’t cost an action to trigger, it costs a basic die, and it allows you to directly place wound tokens on the targeted unit, thus bypassing all the effects that trigger on damage like those I listed before. And the cool part is that the Enchanted Violinist is not exhausted for using it, so you can trigger it multiple times in a round, as long as you have dice available, and are able to trigger it. Right, because the issue here is you need an opponent to discard any number of cards off the top of their deck. 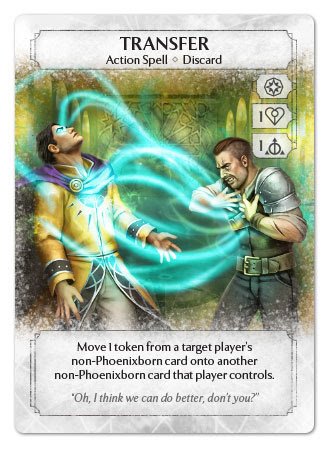 No worries: on top of your opponent’s meditation (which you can “facilitate” with an aimed use of your Illusion dice) we also have already seen some tools this deck has to force discard: Saria’s Heart’s Pull is the most effective, but Purge can work too, if you have dice to spare. “Hey” I may hear some of you say “This is not the card that’s in my deck!”. Right, because last July, the Enchanted Violinist received an official errata from the designer itself, as the original version was perceived (deservedly, in my opinion) as too powerful in constructed play, mainly because you could trigger Song of Sorrow “at will” by discarding your own cards thus wreaking havoc among the enemy lines with ease, but also because – costing nothing – you could recover her almost infinitely with Ceremonial dice. Personally, if restricted to preconstructed decks, I don’t mind the original Violinist too much, as it is restrained by the overall mechanics of Saria’s deck, but in constructed play it definitely was a beast, so the change has been for good. 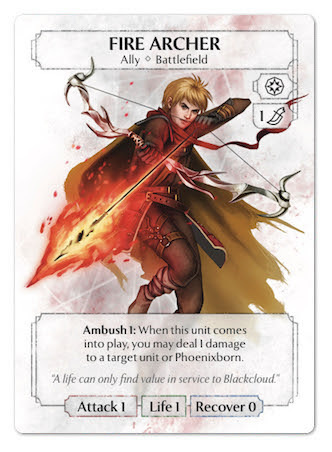 The other ally, the Rose Fire Dancer is not that much problematic… 3 attack and 1 life for an Illusion and a Basic die is fine, though you need to be extra careful of cheap damaging effects or you are going to waste those two dice with no significant return. 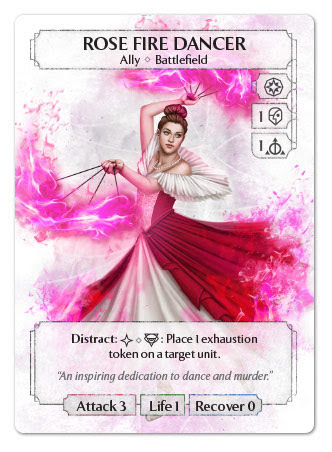 The dancer’s Distract ability allows you to spend a side action and exhaust her and another unit, which is quite a good trade for 2 dice, considered that you could play the Rose Fire Dancer and use her ability in the same turn to get temporarily rid of a strong threat like a Hammer Knight or a Frostback Bear. 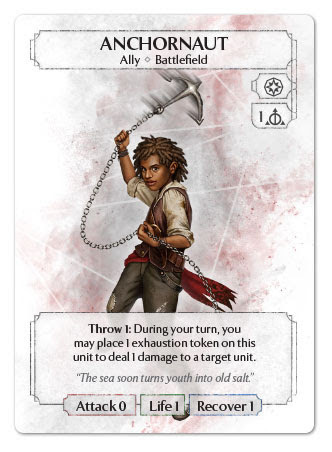 Sure, she will keep a Battlefield slot occupied for a while, but she’s so fragile she probably won’t last long; and if she does survive until the end of the round (remember you have Charm dice if you need), you would have access to a continuous source of exhaustion, or to a deceptively strong attacker. Where Saria’s spellboard works toward achieving the deck discard condition, her action spell provide ways to delay the enemy and get extra power to fuel the deck. Hidden Power is one of the most ubiquitous cards in the game, and it’s probably one of the most valid reasons to splash a couple of Illusion Dice in a deck (in addition to the annoying Illusion power itself). Does it deserve all its popularity? 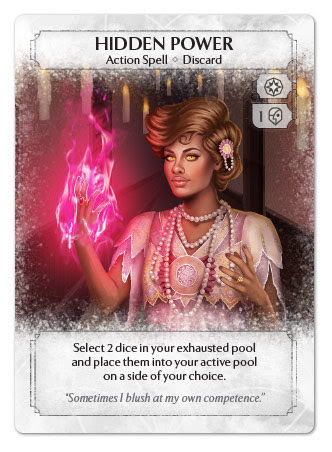 Let’s see: at the cost of a Main Action and an Illusion die, it allows you to get two exhausted dice (one of which can be the one you spent to play this card, as dice spent to pay cost go into their owner’s exhausted pool before the effect is resolved) and move them back to your active pool, giving you a net bonus of +1 die for the round. As in any resource management game, being able to play with 10% more resources than the opponent, even if just temporarily, can be quite helpful. Moreover, you can choose the facing of those dice, which will most likely show a Power symbol, providing yet another way to reduce the randomness of the dice roll and allowing you to use the right combination of dice when you need them (you can get a Power dice and spend a side action to use its power in the same turn, which is extremely action efficient). A nasty trick you can pull, for example, is this: you spend an Illusion Power die to exhaust an opponent’s die. In a following turn, you can spend another Illusion die to play Hidden Power, recovering both dice and immediately use one to exhaust another enemy die, having a third Illusion Power available for a future turn to further undermine your opponent’s energy reserve. Illusion is really annoying, don’t you think? Speaking of annoying things Illusion can do, we have Seal. 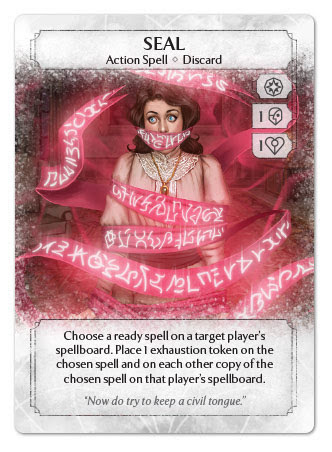 This action spell is the only card in the game that costs both Illusion and Charm so far, and its effect is pretty straightforward: you name a ready spell in play, and each copy of that spell in a target player’s spellboard gets exhausted, being unusable for the round. 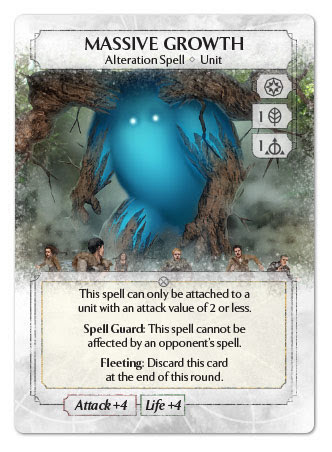 Similar to Noah Redmoon‘s Shadow Target, this spell is quite annoying in the first round, as it renders one of the opponent’s First Five useless (combine with Three-Eyed Owl for maximum effectiveness, as the opponent will be left with a First Three), but contrary to Noah’s ability, it doesn’t lose its utility through the course of the game, as you will always be able to exhaust multiple spells at once. Furthermore, it indirectly helps your discard strategy, as when your opponents find themselves unable to use what they already put on the board, they’ll most likely play cards from their hand, lest their dice remain unused. Playing cards from the hand means they’ll most likely draw more cards next round, which in turn helps you wear their deck thin. Another card with unique design, Strange Copy is really intriguing, but unfortunately depends a lot on what units your opponent plays, and has the inherent drawback almost all Illusion-based units have of being unable to stay in play for long, this time due to its Fleeting ability, which means you need to use it the round you play it, or it will be wasted. So, what does it do? For two Illusion Dice (a non-trivial cost, unfortunately) it becomes a temporary ally in your battlefield, with Attack and Life equal to the number of Status Token on it, which in turn, is initially equal to the Attack value of a unit currently in an opponent‘s battlefield. So, for example, if you choose a 4-attack Hammer Knight your opponent has in play, the Strange Copy will have 4 Status token on it, and would count as a 4 Attack / 4 Life / 0 Recovery ally. The stronger and more expensive the unit you copied, the more cost-efficient this card becomes. 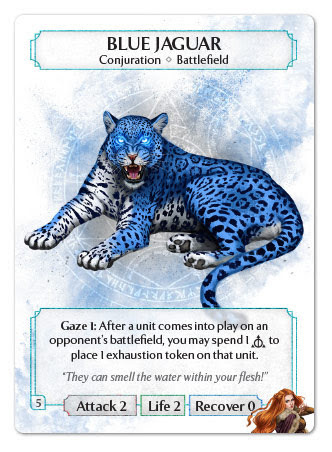 Note that the current attack value of the chosen unit is used when determining the number of Status Tokens to place on the Strange Copy, not the value printed on the card, so for example if the opponent has a Blue Jaguar (Attack 2) with a Massive Growth (Attack +4) on it, the Strange Copy would come into play with 6 Status token on it and would be a 6/6 ally. Moreover, once the number of Status tokens is set, any modification in the chosen unit’s Attack won’t modify the number of Status tokens on the Strange Copy. Also remember that, while you can’t place alteration spells on this card, you can place Charm dice on it to get it stronger: a single Charm die will enable it to trade 1-on-1 with any unit that it copied and survive the exchange of blows. 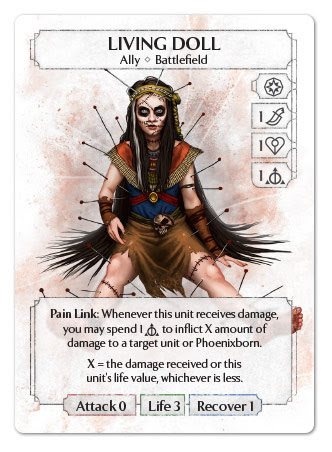 Sympathy Pain is probably one of the most powerful reaction spells in the game, allowing you to deal 3 damage to a target unit or Phoenixborn after your Phoenixborn has received damage, at the cost of 2 Charm dice. A 2 dice / 3 damage exchange is definitely good (though a bit magic-intensive as you need two class symbols to trigger it), more so for a direct damage spell, although it comes with a triggering condition that in fact lessens the damage differential you’ll be able to achieve, as you would gain at most a 2-damage advantage over your opponent. 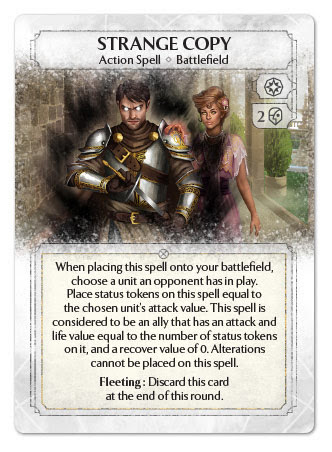 Nevertheless, its triggering condition is quite easy to achieve, and the game offers various opportunities to trigger it by yourself so that you could minimize its drawbacks, especially in constructed play (taking damage by recovering allies through the Ceremonial power comes into mind as one). In the context of this preconstructed deck, the only way to self-trigger Sympathy Pain is by taking damage with Abundance for choosing not to draw, so it is mainly used as a “punishing” tool against opponents that attack you, both as a way to deal direct damage to their Phoenixborn, or as a unit-removal card, in a way similar to Shadow Counter. Lots of tools to limit the opponent’s options: battlefield control, hand discard, and dice exhaustion among them. The opponent will struggle to advance their strategy. This deck is very good in long games, where it stalls the opponent and slowly discards cards from their deck until they take damage for not being able to draw. 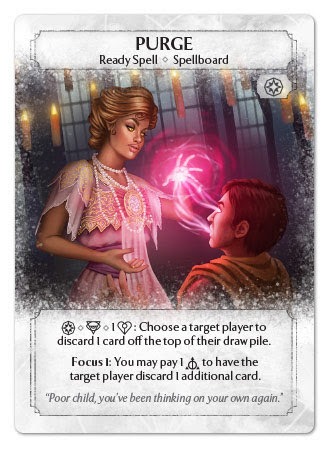 Incredible card draw capabilities, combined with relatively cheap costs and dice recursion, that will allow to gain and keep card advantage throughout the game. 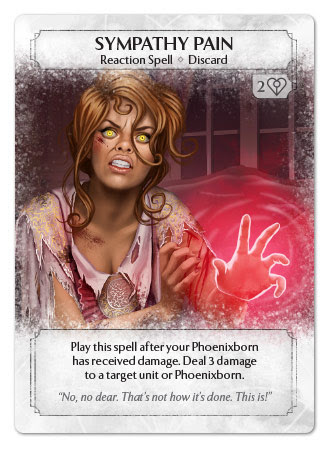 The deck has few ways to attack and/or directly damage the enemy Phoenxiborn, and to be aggressive in general. It must rely on controlling the opponent’s resources and battlefield to be a serious threat. The discard strategy takes a while to kick in, forcing you to forfeit immediate rewards and spend dice and actions planning for the future. In the meantime the opponent would have the possibility to apply a lot of pressure to you and unless you delay their game, they’ll probably win before all your efforts come into fruition. Even if you manage to delay defeat long enough, you won’t have the resources to stop everything the enemy throws at you. You need to be careful about selecting which key units, cards and dice to control. And with that, we have seen all the cards in the Core Set. Thanks for staying with me along the way. Before we begin to take a look at the various expansion decks, I’d like to talk about the first step that needs to be taken when passing from preconstructed to constructed decks: deckbuilding. Until then. Thanks for reading!